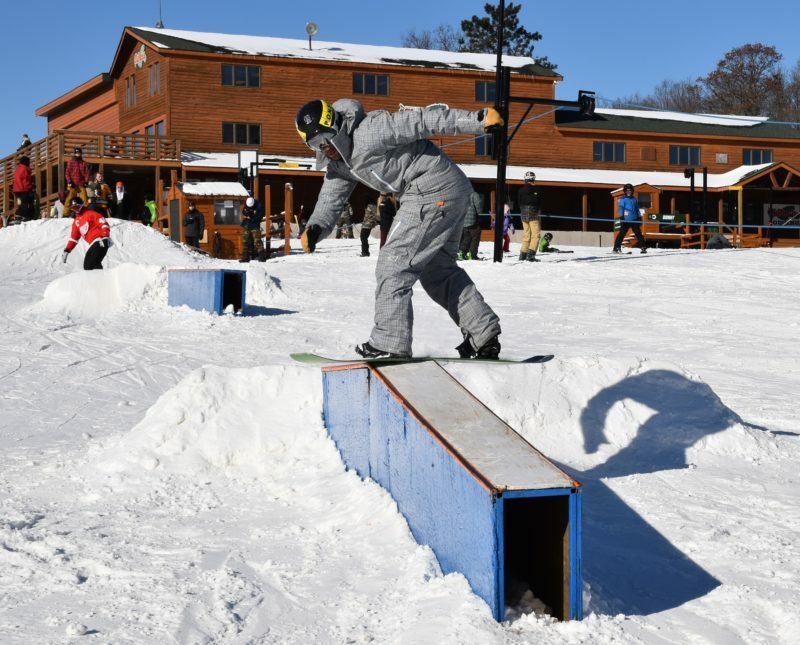 Michigan Terrain Parks Ski Brule! A variety of features make riders completely at home while at Ski Brule. Brule Parks are designed so riders have a progressive system of features to learn and develop their skills. Smaller boxes, wider rails and series of jumps that start off small and increase as skills become more advanced. This is what makes Brule Parks the best snowboard terrain in the Midwest. The diverse terrain and varying pitches that wind through wooded forests give riders a ‘mountain experience’. Rails, boxes and jumps change throughout the season to keep the three parks fresh and interesting. The Bambi Playground rail park is ideal for those just learning to ride rails or those that simply can’t get enough rail time. Ski Brule is dedicated to creating fun and diverse terrain that is designed for any ability level. Expect to see jumps and kickers of all sizes, from small to big air in the terrain parks. Rails and boxes too! Mornings are very busy at Ski Brule preparing the snowboard park to make your day on snow the best it can be. Three terrain parks offer an array of features for wide range of abilities and interests. The playful turns, switchbacks and berms on Timber Doodle and Double Doodle are sure to put a smile on your face. If it’s a corduroy groomer you prefer, the Ski Brule grooming crew is the best there is! What is an Acrobag? It is a blast!! Acrobag Pass Is FREE With Your Daily Ski Brule Lift Ticket or Ski Brule Season Pass when available! Whether it’s for fun, trying your first jumps or you are a serious athlete looking to progress to the next level, try the Acrobag at Ski Brule. The Acrobag is a tool that will help you focus on learning a new trick without the fear of a hard landing. You can practice over and over again until you get it right and it’s absolutely FREE! The Acrobag pass is free with a daily lift ticket and available at Guest Service. Helmets are required, minimum height 54″. The Acrobag availability is subject to weather, snowmaking and special events. Participants must have a daily lift ticket, helmet and a guardian signature is required for participants under 18 years of age. Acrobag Use & Liability Release to be completed by participants each day of use. Acrobag: TBD, subject to weather conditions and special events. Acrobag passes are available at Guest Services. One way to make your day on snow even better is to ride on your own snowboard! You may be thinking that a snowboard package will cost you $500 or more so you keep putting the purchase off. There’s no need to! Ski Brule’s Bear’s Den Pro Shop $379 snowboard package includes the snowboard, boots, bindings, leash, binding mounting and full tune. Make the most out of your day skiing in Michigan with the purchase of a snowboard package.